This article submitted by Michael Jacobson on 10/6/99. Fifteen volunteers, many from as far away as the Twin Cities, braved cold temperatures and brisk winds to work at The Nature Conservancy's Regal Meadow preserve on Saturday. The preserve, located two miles north of Hawick on 160th St. NE in what is commonly known as the Regal flats, entails 385 acres at present. 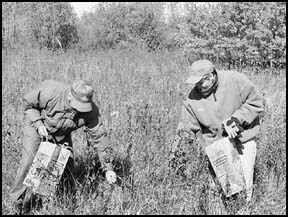 The Nature Conservancy acquired the land from four landowners in stages fron 1979 to 1985. A renovation project is being planned on the west side of Regal Meadow, according to Garth Fuller, a land steward with The Nature Conservancy who manages their preserves in the eastern half of the state. An old farm field in the northeast corner of the preserve, near Kandiyohi County Road 2, has been plowed and native grasses and flowers will be planted in hopes of restoring tall grass prairie. A commercial company was contracted to harvest wild grass seeds. They use a small grains combine, modified to collect seeds of various sizes. Fuller said the height of the combine can be adjusted to collect seeds at various levels, but still the mechanical method works primarily for collecting common plants like little bluestem and Indian grass. Mechanical harvesting was also done at The Nature Conservancy's prairie preserve near Roscoe. On Saturday, the volunteers were charged with finding and collecting seeds from certain kinds of plants and flowers that the machine tends to miss. "They miss a lot of small flowers," explained Fuller, "so we're going in to get those by hand." Two volunteers from Minneapolis, David Foster and Karen Grewe, collect seeds Saturday morning. Among the flowers that were collected by the volunteers were purple prairie clover, golden alexanders, sunflowers, blazing stars, mountain mint, rigid goldenrod, and bottled gentian. "We had a great supply of seed that we took right over and planted in the restoration area," reported Fuller on Monday. Limited volunteer work has been done at the preserve in the past, mostly to cut down aspens that impinge on the meadow. "We hope to do more," said Fuller. "People really seem to like it." "It's a nice excuse to get out," said Mary Moreira, a math and science teacher from Minneapolis who spent Saturday afternoon at Regal Meadow. "These are neat places, and you meet lots of wonderful people when you volunteer." Fuller also plans to conduct more controlled burns of the prairie. Without the burns, he said, aspen and willow trees creep into the prairie. Scientists estimate, according to Fuller, that the prairie was burned every five years before settlers arrived and Native Americans ruled the land. When hay was still the primary crop on the land in the early part of this century, the fields were often burned to improve the crop, which would occasionally escape and burn some prairie, according to The Nature Conservancy. But since 1960, wildfires have stopped. Burns are advantageous to native plants, exposing top soil, scorching competitors, and leaving a layer of ash that microorganisms can turn into fertilizer. "Native plants are adapted to fire," Fuller explained. "They've lived through it for a thousand years." Fuller said Regal Meadow has not been burned in at least 20 years. He has tried to have a controlled burn for several years, but each spring the ground is too soft to mow fire breaks. The preserve contains considerable wetland areas, and even the high spots in spring tend to be soft. In addition to the restoration work, Regal Meadows will be expanding soon with the addition of over 100 acres of nearby land. An international organization, The Nature Conservancy aims to protect plants, animals, and natural communities by preserving their natural habitat of lands and waters, according to background material supplied by the organization. The Minnesota chapter has 20,800 members and has helped protect more than 327,000 acres in the state. Preservation is done by ecoregion. Both the Regal and Roscoe prairies belong to the prairie-forest border, an ecoregion that stretches from northwest Minnesota to the southeast corner. This is the ecoregion where prairies meet woods, and the result is a combination of the two geographic features. 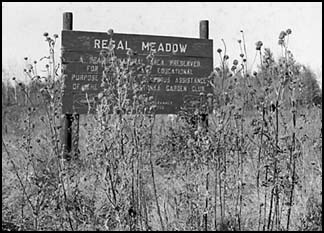 Regal Meadow lies in part of the ancient outwash valley of the Crow Wing River, according to The Nature Conservancy. It includes wetlands, and, on higher ground, wooded areas and portions of prairie. A notable plant is the small white lady's slipper. Naturalist ancestors of Annabelle Ruhland, whose land now comprises part of the preserve, were interested in the preservation of that flower, among others. With a few exceptions, preserves operated by The Nature Conservancy are open to the public. Visitors are welcome at both the Regal Meadow and the Roscoe Prairie. "This is a beautiful place," said Fuller, of Regal Meadow, "but there are so many wetlands it's hard to get around." The preserve is excellent habitat for wildlife, he added: "It's a real hot spot for wetland fowl." To get to the Roscoe preserve from Paynesville, take County Road 33 and turn right on County Road 16. After a mile, turn south on 273rd Ave. Roscoe Prairie borders the abandoned railroad bed.